One hundred years ago, in 1910, Red Deer enjoyed one of the strongest booms in its history. A significant factor in that boom was an enormous amount of railroad construction and development, involving three different railway companies. Probably the most important boost to the local economy came with the decision of the Canadian Pacific Railway (CPR) to make Red Deer the major divisional point on the Calgary-Edmonton line. Some $250,000 was spent on the project, an impressive sum when one remembers that $1.50 to $2 per day was considered a pretty good wage at the time. Among the structures built by the CPR were a large new roundhouse, an elevated coal tipple, a new water tower and a new steel bridge across the Red Deer River. In the spring of 1910, work began on the crowning glory of the whole project, an impressive two-storey brick station that straddled the western end of Ross Street. The location of the station was not an accident. Since the building was the major transportation hub for the community, the CPR wanted it to be visible from all points along the main street. Fredrick Crossley, the CPR architect in Winnipeg, was given the job of drawing the plans for the new building. He patterned the Red Deer station after the one that had been built in Lethbridge. 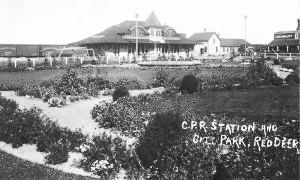 RAILWAY HERITAGE - Red Deer's newly constructed CP Railway station in 1910. In this photo the old 1891 station is located to the north. It was later relocated to the south of the main station and used as a freight office. In August 1910, the nearly completed CPR station was the initial reception point for Sir Wilfrid Laurier, prime minister of Canada, who was making his third visit to Red Deer. This latest visit was part of a Western Canadian tour to gauge political opinions and issues in the region. However, another scheduled event was the driving of the first spike for the Alberta Central Railway. The Alberta Central had been around since May 1901, at least on paper. That was when a charter was granted by the federal government to a group of Red Deer and Ontario businessmen. Originally, the rail line was authorized to run from Coal Banks, near modern day Delburne, to Rocky Mountain House. However, over the years, the ACR's charter was amended to allow it to run its line from the Fraser Valley through the Yellowhead Pass to Moose Jaw, with extensions to Saskatoon and the Hudson Bay. In short, it was planned that the ACR would eventually become a "transcontinental" railroad extending across the whole of Western Canada. Action on the building of the line, however, did not get underway until April 1909 when the federal government offered a construction subsidy of $6,400 per mile. Soon crews of surveyors were laying out a rail route. Some brushing and grading commenced in the spring of 1910. On Aug. 10, 1910, Sir Wilfrid Laurier drove the first spike at a spot on the east side of Gaetz Avenue, not far from the current site of the Capri Centre. Just as the ACR finally started construction, another railway company appeared on the scene. It was the Canadian Northern Western, a subsidiary of the CPR's main rival, the Canadian Northern Railway. The intent of the CNWR was to build a line from just north of Red Deer westwards to Rocky Mountain House and then on to the new Brazeau coalfields at Nordegg. The company was anxious to build as fast as possible. Therefore, it closely followed the route which had already been mapped out by the ACR. Having not one but two railroads being built, literally side by side, drove up construction costs dramatically. However, with wages for labourers rising by 50% and with prices for things such as oats soaring to three times the Alberta average, there was soon a wonderful economic boom in Red Deer and across West Central Alberta. Unfortunately, the ACR found it increasingly difficult to manage financially. The Company did not have enough capital to fulfill its grand plans. With prices and wages leaping, there was no way that the ACR could cover its day-to-day bills. Thus, the ACR slipped into bankruptcy in early 1912. Construction of the Red Deer to Rocky Mountain House portion of the ACR line was finished up by the CPR. Nevertheless, for a few years, all of the railroad activity created a wonderful surge of prosperity and growth for the community. Moreover, Red Deer's place as the pre-eminent transportation and distribution hub of Central Alberta was now assured.